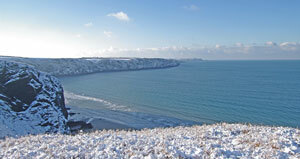 The Pembrokeshire Coast Path is one of the most attractive and interesting stretches of footpath anywhere in the UK. It continually reveals new views of islands, red sandstone cliffs, spectacular beaches, carpets of flowers and a transparent turquoise sea. On the south of the Marloes Peninsula, the path follows the cliff behind Marloes Sands along to Gateholm - scene of a Time Team dig in 2011. Out to sea, the island of Skokhokm can be seen. It then skirts behind Albion Bay, named after the wreck there, parts of which can still be seen at very low tides, and along open cliff top, passing through the iron age hill fort (also investigated by the Time Team). The open grassy cliff top here has been the subject of experiments to return what was once arable farmland into heathland, by the application of raw sulphur. In some places this has resulted in rather bare patches, where nothing will grow at present, but in other areas heathland plants are returning and the short turf provides feeding areas for Chough and big flocks of larks, pipits and finches in the winter. 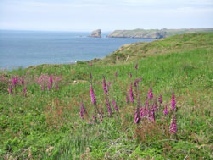 The path then circumnavigates the Deer Park, with its splendid views of Skomer and Jack Sound, and turns back eastwards past Martins Haven and along a high stretch of cliffs to Musselwick Beach. The path then runs north along another high stretch of cliffs towards St Brides. It passes Tower Point and the Nab Head, both sites of archaeological excavation, then passes by St Brides castle and then down into St Brides Haven. 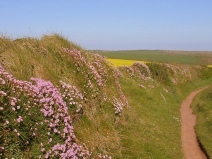 From St Brides the path carries on eastwards along scenic craggy cliffs with excellent spring wild flowers to Mill Bay. MARLOES SANDS CAR PARK There are several routes to the coast path from the car park. The path which turns left across the fields just after the Youth Hostel is interesting because of the successful return to heath vegetation visible in the second field. The track which goes past the Youth Hostel also eventually leads to the coast path at the Iron Age fort, passing Marloes Mere on the way. A track leads northwards from the car park which can be used to link up with the coast path on the north side of the peninsula. MARLOES VILLAGE The path down to Musselwick Sands starts from the road just to the east of the village. A second path links from the north side of the peninsula to the road about 1 km east of the Deer Park - this is useful path for circular walks. DALE From Dale, there is path through the valley to West Dale, where the coast path can be taken along the edge of the old airfield and along to Marloes Sands. ST BRIDES There are several possibilities for circular walks from St Brides, perhaps the best being along the coast path to Mill Bay and then back through Lower Broadmoor, past Upper Ripperston and back along the road. A longer loop heads south from St Brides along the edge of the woods, then past Fopston to Marloes, then down to Musselwick and back along the coast path.